New Found Glory set out to headline a night of classic pop-punk, but ended up topping the bill on a diverse line up for this year’s Kerrang! tour. After Sum 41 pulled out due to frontman Deryck Whibley’s back injury, their replacement, South Wales’ The Blackout, took to the stage with an apology ‘sorry we’re not Sum 41’ and attempted to appease the situation with a pretty impressive cover of the Canadians biggest hit, "Fat Lip." 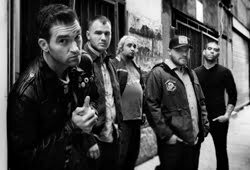 Playing their first UK shows since the release of seventh studio album, New Found Glory power through a back catalog of storming pop punk classics. NFG bounce along with as much energy and enthusiasm as if it were their first UK tour - not bad for a band that’s been around for over a decade now. Surprisingly, though, about half the crowd admit to never having seen the band play, yet tracks like "Dressed to Kill", "Kiss Me" and "Don’t Let Her Pull You Down" are met with open arms. The band only play three songs from the new album, in spite it being their first time this side of the Atlantic since it’s release - title-track "Radiosurgery", "Memories & Battle Scars" and "Anthem For The Unwanted". Throw in a couple of covers - "Blitzkrieg Bop" and Green Day’s "Basket Case" and you’ve got another great New Found Glory gig. The highlight of the evening, however, might just be the revelation that the “Pop Punk’s Not Dead” tour - which hit the US last year featuring NFG, Man Overboard, Set Your Goals and The Wonder Years - might just be coming the the UK. We’ll keep our fingers crossed!